In my mid 20s I had my first fiddle lesson. I went home and alternated between two tunes for eight hours straight only stopping to eat, I was obsessed. For the next five years I stubbornly insisted on teaching myself, without a teacher, how to play fiddle while missing out on much of the subtleties that old time fiddling had to offer. When I finally studied with someone else my biggest epiphany was the role and importance of rhythm and bowing within old time music. If only someone had told me 5 years earlier to pay attention to my bowing hand It would have saved me a years of grief and frustration. Over the last decade of teaching I have crafted a method of teaching that starts at the beginning and progresses in a methodical and intentional way to get my students jamming in social situations as quickly as possible. I offer in person lessons in Asheville, NC, and online Skype lessons for players of all levels. Lessons include access to my instructional videos to aid your learning process. Check out the videos below to see examples of my unique teaching style. 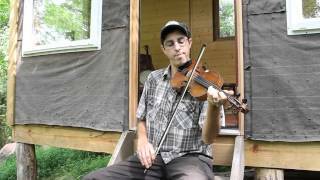 Are you interested in diving deep into Appalachian Fiddle? Let’s talk about what an internship might look like. I am always open to bartering for lessons. What skills do you have to trade? Contact me at michael.ismerio(at)gmail.com or call me at 503-808-0362. I believe in starting at the beginning. And this is the best beginning I can think of. 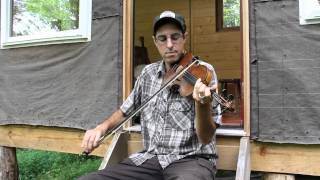 This Basics of Bowing instructional video series is designed to teach you the five most common bowing rhythms that are heard over and over within the world of old time fiddling. They are not the only rhythms you will ever play but they are definitely the foundations to start from. I am a strong believer in rhythm first, melody second. So I recommend learning the bowing first on open strings with no melody notes, then plucking the melody without the bow, and then do the challenging work of merging the rhythm and melody together without changing either part, Pause the video between sections. Don’t forget to smile, breathe, and have fun. 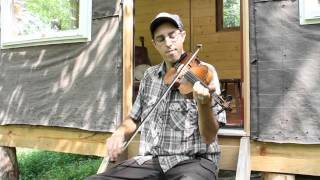 When you have learned these five tunes my Fiddler’s Journey series is designed to take you much deeper on your musical journey. 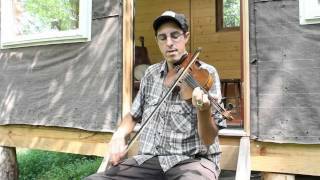 For all the videos below my fiddle is tuned to cross G (GDgd). You can play these tunes out of standard tuning but it won’t be nearly as fun. Below are the companion audio files to my Basics of Bowing Workshop. You can play the audio tracks directly here on the site, or download the .MP3s directly to your computer. 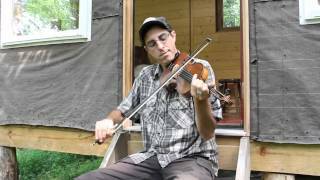 Below are the some videos of me playing a few tunes up to speed in front of my cabin. 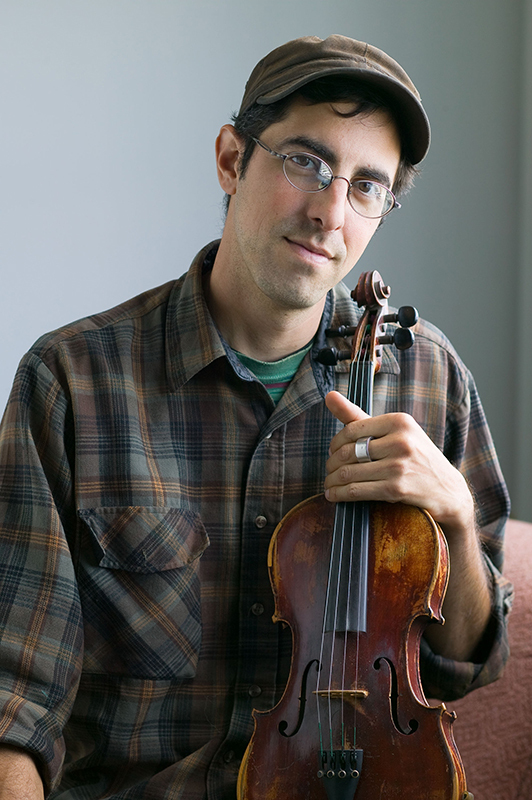 This is a two hour workshop focusing on identifying, naming, slowing down but mostly playing the exciting rhythms, pulses, and drones that give Old Time fiddling it’s distinctive sound. The object is to point out and demystify the half of old time fiddling that often gets neglected; the bowing hand. In the workshop I break down each of the bowing movements or rhythms that I use, teach the group to replicate them and then play them in the context of a melody. Basically, It’s the workshop I wish I had taken years ago when I first started fiddling. This workshop uses mostly your bow hand to get your muscle memory used to playing the rhythms. 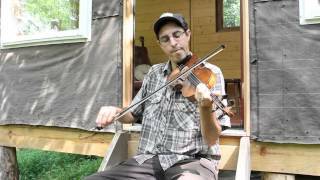 It’s appropriate for all levels of fiddlers, beginner or advanced, young or old, and anyone who is interested in teaching techniques. This intermediate workshop builds off of my Basics of Bowing workshop and will use my same unique teaching style to help build your tune repertoire. I will be using the same tools that I teach in the bowing workshop but this time focusing on joining the bowing patterns with the melody. Two or three old time tunes will be taught.